In this chapter, the sliding mode control (SMC) design for a class of continuous-time linear uncertain systems is considered based on the parametric approaches utilizing the Lyapunov (or Riccati-like) inequalities. SMC for the continuous-time linear systems is one of the well-known issues in control theory. However, this chapter addresses a new aspect of SMC for linear uncertain systems and establishes a systematic procedure to design a sliding hyperplane having multiple design objectives. 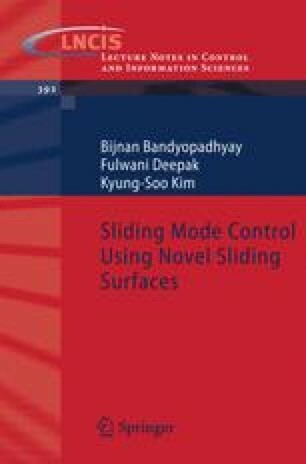 In the literature, much effort has been made to design sliding modes that satisfy the desired performance criteria. The well-known criteria include quadratic performance optimization , guaranteed H2 cost minimization , eigen-structure assignment including pole-clustering [25, 31, 37], robustness to parametric uncertainties [88, 64, 107], and so on. Note that all these approaches are concerned with satisfying a single design objective. Moreover, the design objectives have not been presented in a unified framework.